Our beautiful ground floor condo in the popular Kihei Akahi is privately owned, and we are proud to call it our second home. We have provided all necessary amenities to make the kitchen and unit fully functional. This ground floor condo opens up to a lanai with a garden view of plumeria trees, hibiscus and palms – the perfect extension of the living room. The security lanai door enables easy access directly across the lawn to south Kihei’s beaches, two pools, pool-side BBQs, and the tennis court. Air conditioning, ceiling fans, and afternoon trade winds keep the condo cool. 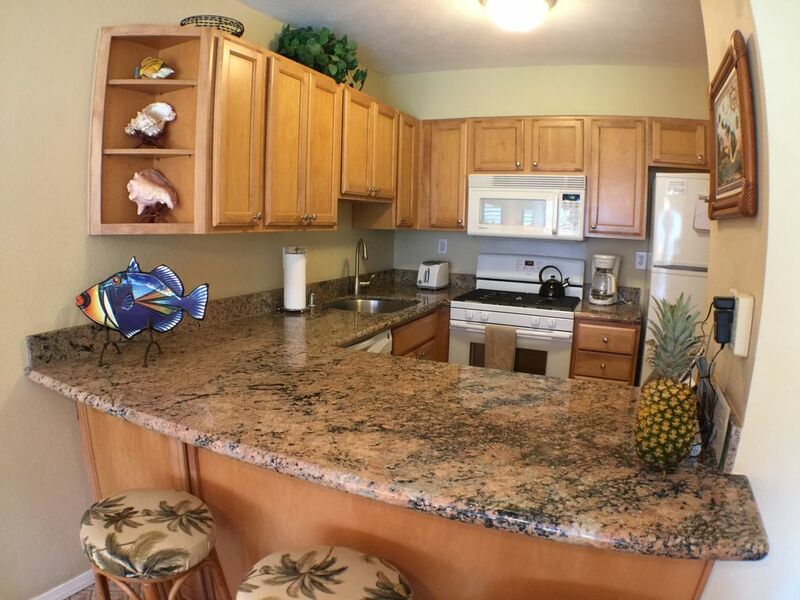 The condo provides Hawaiian furnishings, décor featuring local artists, an in-unit full sized washer/dryer, one reserved parking space, a security safe, and beach gear (chairs, towels, boogie board, water straws, cooler). Other amenities include free telephone calls to the U.S. and Canada, high-speed Wi-Fi internet access, and a LCD flat screen Smart TV with cable. Recycling bins are located next to the tennis court. Location – Kihei Akahi is located directly across the street from Kamaole Beach II, a great white sand beach great for swimming, snorkeling (around the two rocky points at the north and south ends of the beach), and for watching sunsets. Many restaurants, shops, and grocery stores are within close walking distance from the condo, and several open-air restaurants are directly adjacent to the property. Visit beautiful sunny Kihei and experience why we love south Maui! Tom and Karissa Anderson Aloha, and mahalo for visiting our VRBO page! We live in Northern California and have traveled to the Hawaiian islands many times. Maui is our favorite island since in our opinion, it has the best beaches. We plan to enjoy it for many years to come and hope that you will enjoy it as much as we do. Kihei Akahi had everything we were looking for – close proximity to beautiful beaches and convenience to stores and restaurants. We also appreciate the attention to detail regarding landscaping and maintenance. We thought that our guests would appreciate this as well! Our unit is upgraded, tropically decorated and well-maintained. Our ground floor unit makes access to the pools and beach very convenient. LCD flat screen TV in living room with cable. TV in bedroom is for videos/DVDs only (no cable connection). Condo is clean and well kept. All the essentials were on hand for use. Located across the road from beaches and also in a good central location. Only reason I did not give it 5 stars was due to a problem with the dryer. A previous user apparently dried clothes that had gum in the pocket. Discovered this after drying a load of clothes and getting it on some of my pants. Took me about a half hour to clean the drum sufficiently to dry another couple of loads of clothes. The resort was great, the apartment was well taken care of the location was clean and secluded but had easy access to the attraction we visited, would stay here again and have already recommended the rental to others. The rental was well supplied with everything we needed. Good to be back in sunny Kihei, the month of March was fantastic. Loved being on the ground floor, enjoyed afternoons sitting in the grassy area in front of our unit. Our accommodations were wonderful, well stocked, bed was good. This one-bedroom condo was exactly to our liking, a home away from home! Everything was made comfortable, convenient and helpful. The décor is lovely, with many beautiful upgrades to enhance it. The location was absolutely PERFECT, close to shopping, restaurants, parks and the beaches. Sunsets were gorgeous and moonlight stunning. The community at Kihei Akahi is very quiet and amiable, we felt like we were on our own tropical island. Thanks for a great vacation! We've stayed here four years in a row and its absolutely the best place to stay. The owners are so nice, the condo is ALWAYS extremely clean and well put together and welcoming. It's the perfect unit at the perfect location in Kihei. Right across from our favorite beach Kam II! At highly recommend this unit to couples. What a fantastic unit in a great complex. It is exactly as it is pictured. The amities that you have aren't easily found. It is fully equipped and remodeled. You couldn't ask for better! Thank you so much for making my 1st trip to Maui memorable and comfortable. Tax Rate: 14.42% Cleaning Fee: $120 Rates are subject to change until reservation is confirmed. Payment will be made via credit card through VRBO. A 25% deposit is due at time of booking. :: The remaining balance of 75% is due 60 days prior to arrival. :: If the reservation is cancelled by 60 days prior to arrival, there is a 100% refund. Cancellations made by 30 days prior to arrival receive a 50% refund. :: Cancellations must be made by 12:00 PM (property's local time) on the appropriate day. Unit is privately owned: Hawaii GET Tax ID GE-117-323-1616-01. TAT Tax ID TA-117-323-1616-01. Local management: Rentals Maui (808) 879-2700.